Are you trying to be healthier, but think there is no one solution to your problem? YOU'RE RIGHT! I was unhealthy and unhappy, there is no other way to say it. I had tried (and failed) to lose weight using every new diet that I found. Nothing worked. I had friends that were slimming down and looking better and I just couldn't figure out what they were doing that I wasn't. That's when I found my own secret to looking and feeling amazing. 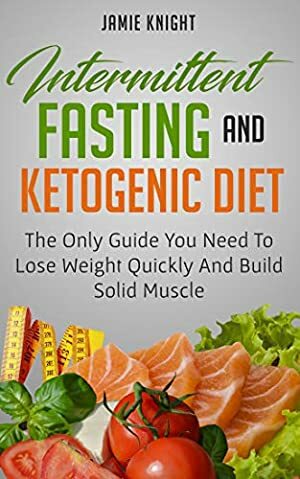 "Intermittent Fasting And The Keto Diet" reveals the #1 key to winning your war with the scale: Combining two nutritional plans to create an incredibly effective weight-loss program. Individually, Intermittent Fasting and the Keto Diet do great things for your body and encourage it to burn fat while building muscle. Individually, though, they aren't always enough. Together, they are unstoppable, and you will be too. Before you read this book, there's something you should know: This is not a "lose weight fast" miracle program. This is for people who really want to lose weight and are willing to put in the work to look their best. - Recipes you can make at home to eliminate any guesswork. But, Jamie, I'm not sure... what if Intermittent Fasting And Ketogenic Diet isn't for me? The scary thing is... YOU MIGHT BE RIGHT! This is where many people will give up and click off the page. Maybe they think it's the same as all those other diets. Maybe they think it can't possibly work for them. THEY ARE DEAD WRONG AND MISSING OUT. The only way this 1-2 punch nutritional plan doesn't work is if you are lazy, uncommitted, or give up easily. However, if you want to feel better and look better then this is your book. Scroll to the top and click "BUY NOW" and begin the journey toward your dream body. Only you decide It all starts now. We started tracking this book on November 16, 2018.